NEW from the laboratories, Fibrecoat has been specially developed to enhance the performance of Refractory Ceramic Fibre (RCF) in all applications, whilst at the same time solving many problems associated with the reclassification of RCF as a Class 2 Carcinogen. Binds the surface fibres forming a thin, tough and inert, biscuit coloured ceramic skin. Renders ceramic fibre harmless in use. Extends fibre life and maintains insulating properties for longer. 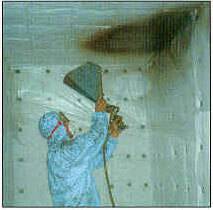 A low cost spray coating to seal and protect all types of fibrous insulating materials. Successfully used in a wide variety of industries and operating environments. Prevents fibre dust contaminating the working environment. Applicable to new or existing linings. Suitable for glazed or unglazed product manufacture. Offers greater protection than alumina based coatings. Fibrecoat is a zircon based refractory composition specially developed for use as a surface coating and binding agent for ceramic fibre and other fibrous refractory insulation materials. Fibrecoat will enhance the performance of Refractory Ceramic Fibre (RCF) in all applications, whilst at the same time solving many problems associated with reclassfication of RCF as a Class 2 Carcinogen. By binding the surface fibres and forming a thin skin over the ceramic fibre linings, Fibrecoat strengthens the surface of an otherwise weak material greatly improving its resistance to erosion in areas subject to high gas velocities, flames, splashes from molten metals and many industrial chemical processes. The ceramic fibre is rendered harmless under normal conditions of use and is also able to serve closer to its general classification temperature. Improved insulation is also achieved as the layer of Fibrecoat stops the passage of hot gases into the fibre lining reducing heat loss from energy radiated into the fibre. Reduced surface dusting and broken fibre breakdown. Fibre is protected against chemical attack from combustion gases and harsh process environments. The fibre works closer to its specified maximum working temperature. Reduced penetration of hot gases into the fibre. Reduced heat loss from energy radiated into the fibre. Improved insulating quality of the fibre. Increased lifespan of ceramic fibre linings. Fibrecoat is suitable for use on both new and old fibre linings. Fibrecoat should only be applied to clean, sound surfaces. Any loose material, powders or contamination should be removed. Fibrecoat should not be applied to RCF which has been treated with silica-sol rigidisers, neither will it adhere properly to modules containing processing oils. Any mineral oil should be burnt off prior to application of Fibrecoat. 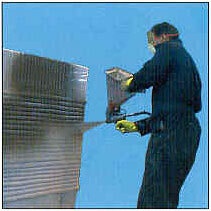 The product is designed for spray application using textured paint or cement spraying equipment. It may also be brushed onto hard surfaces. A coating of approximately 1.5mm will provide economical protection to most ceramic fibre linings. A gas tight coating is attained at >2.5mm. Several thin coatings each allowed to dry out are the best way of achieving thick coatings (>3mm). Mix 25kg of Fibrecoat briskly for two minutes with 4 litres of clean, cold water using a mechanical stirrer. Allow to stand after mixing for about 40 minutes ( or longer if schedules allow) then re-mix (mechanically) for a further three minutes adding more water at this stage for any final adjustments to viscosity bearing in mind the final application method. For the strongest coating on blanket, spray the fibre surface with cold water to a depth of 5 - 10 mm and then compact the wetted surface before applying Fibrecoat. Allow the coating to dry out completely before firing. 1 mm of dried Fibrecoat over 1 square metre weighs 3 kg. 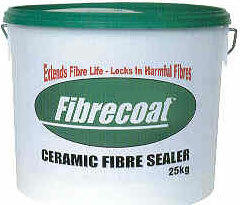 Fibrecoat is supplied as a dry powder in 25kg plastic tubs. Indefinite if stored as a powder in airtight containers as supplied. Approximately 12 months after mixing with water. Fibrecoat is odourless, tasteless and non-toxic. After firing, Fibrecoat is unaffected by most acids and alkalis in liquid or gaseous form. Thermal expansion is approxiamately 1 % over the range 0 C - 1500 C.